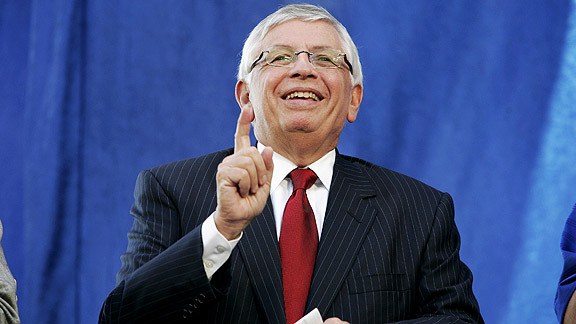 On Feb. 1, 1984, David Stern replaced the retiring Larry O'Brien as the commissioner of the NBA. 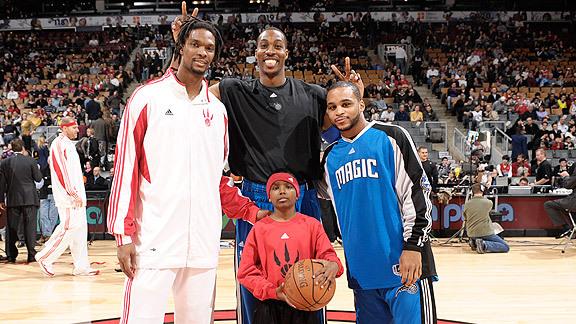 Eastern Conference All-Stars Chris Bosh, Dwight Howard and Jameer Nelson pose with a young fan. 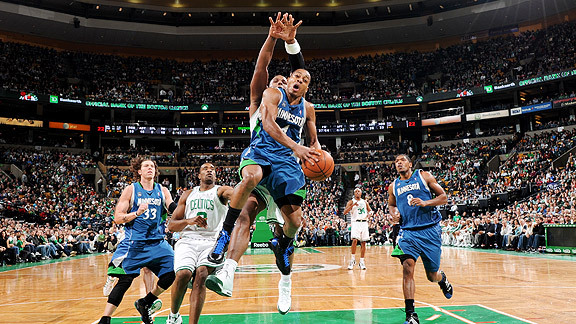 Randy Foye had 21 points and nine assists, but it wasn't enough to get the Wolves a win in Boston. It's a reflection of either the progress under his watch or just how bad the economy really is, but after 25 years as NBA commissioner, race is no longer one of the top challenges facing David Stern. He often has said his proudest achievement as commish has been watching a league that was perceived as "too black" flourish, from soaring franchise values to lucrative TV rights contracts to numerous endorsement opportunities for players. Race never has completely left the discussion, but it doesn't dominate anymore. The NBA routinely gets A grades in Richard Lapchick's report cards for its racial and gender diversity throughout the league and its front offices. There is a black owner. I can't tell you off the top of my head how many black head coaches are in the league right now. I like it that way. The NFL is barely catching up. College football is shamefully far behind. The NBA has moved on. While Stern tends to bring up race only when touting achievements, he sometimes subtly plays off the flames of the touchy topic to get what he wants. In the lockout of 1998-99, he correctly presumed public sentiment and economic pressure would not favor the rich players, but instead the wealthier, whiter owners. He won that battle. He wins most battles. As a white man whose decisions about players affect mostly African-Americans, his position is fraught with public relations perils. After a quarter of a century, he has emerged with respect. The NBA has been the chosen sport of the hip-hop set since the art form's early days, from the shout-out to the Knicks in "Rapper's Delight" to Kurtis Blow's ode to the game in "Basketball." We've seen NBA players rapping as far back as that classic 1987 Converse commercial. But you can't pick and choose only the good parts. Along with beats and rhymes, hip-hop also has meant tattoos and marijuana. And with all that coming into play, Stern's job was to get corporate America to buy suites and sponsorships. It wasn't easy, and it never was more awkward than when the league featured dead white singers in an ad campaign dubbed "Love it Live." The dress code was part of his mission; it sparked a mini cultural war, yet it turned out to be ahead of the curve. Look at the landscape now. Jay-Z disdains wearing jerseys, and Diddy fancies himself a tuxedo-clad James Bond. The NBA was there first. Last season's big story, the Tim Donaghy scandal, did not have a racial angle. The issue for this season and beyond, keeping the league profitable amid a looming depression, is something that affects everybody. This isn't good news, but it is progress that the concerns are tangible issues, not based on ancient perceptions based on skin color. The only remaining racial milestone will come after Stern is gone: the league's first black commissioner. "Our game is global now, and I don't think you could say that about it even 15 years ago. It wasn't quite global, so 25 years ago it was archaic, nonexistent by global standards. So he's done a marvelous job at spreading the game and growing the game." "Obviously, he's been maybe the best commissioner of all time in the 25 years. He's had a large hand in the success of the league up to this point and the makeup of the league up to this point. He's got a lot to be proud of, but knowing David, he's not done. He's a very vibrant guy, and I'm sure he has a whole head full of ideas about how to make it better than it is today." "David saved the NBA. When [our family] sold the [Houston Rockets in the early 1980s], he became commissioner I think shortly after that, or close to that, and really the NBA was headed for disaster, and he saved the league. The league had a lot of problems ... there was no fan interest, no big TV contract. I mean, David single-handedly saved the NBA." "I think one of David's greatest skills is that he truly enjoys being out in front of systemic trends. Technology, media, globalism." Al Jefferson scored 34 points in the Timberwolves' 109-101 loss Sunday at Boston, matching the highest point total by a visiting player against the Celtics over the past two seasons. Only three other ex-Celtics players scored as many as 34 points on a return trip to Boston: Paul Westphal (twice), Acie Earl (40 points in 1996) and Ricky Davis (35 in 2007). • Russell Westbrook scored 34 points, including 20 from the foul line, in the Thunder's 122-118 overtime loss to the Kings. Only three other rookies in NBA history made as many as 20 free throws in one game: Frank Selvy in 1954 (24), Rick Barry in 1965 (21) and Kareem Abdul-Jabbar in 1970 (20). Paul Pierce, Celtics: With Kevin Garnett out with the flu, Pierce picked up the slack by posting 36 points, eight rebounds and six assists as Boston won its 11th in a row. Andrea Bargnani, Raptors: He put together several good games in January, but he didn't get February off to a hot start, missing 12 of 16 shots in a 23-point loss to the Magic. "It means I get another ball in my office, one of those lettered balls. That's good, because the more balls you put in there, it really looks like you're accomplishing something. You can fool a lot of people with that." Kevin Martin got his birthday wish, scoring 37 points as the Kings knocked off the Thunder in OT, ending their eight-game losing streak. The Cavaliers used a big fourth-quarter run to take control in their win against the Pistons on Sunday. Detroit's Richard Hamilton and Allen Iverson had a plus-minus of minus-12 in the period. Here is a look at how the Pistons fared when Hamilton, Iverson and their other guard, Rodney Stuckey, were on the floor.